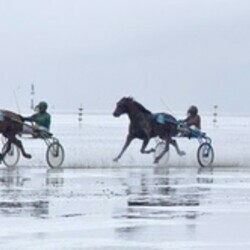 The Hamburg Wadden Sea National Park is not only a UNESCO World Natural Heritage site, but it is also the venue for what must surely be one of the strangest horse races in the world: the Duhnen Mudflat Races near Cuxhaven. Against the dramatic backdrop of the Elbe estuary, an international shipping lane, horses and their jockeys compete in races across the mudflats held at low tide. Visitors can watch this remarkable spectacle unfold from the nearby dyke.